Linfield boss David Healy has set his team target – eight wins before the Danske Bank Premiership split. The Blues remain on the coat tails of title holders Crusaders following Saturday’s victory over Carrick Rangers at Windsor Park. Goals from Mark Stafford and Andy Waterworth – his 23rd of the season – helped Healy’s team to a routine three points. Even though they are still nine points adrift of Stephen Baxter’s champs, Linfield have the chance of reducing the deficit tomorrow night when Dungannon Swifts leave their calling card at the international venue. “All we can do is win our games,” said former Northern Ireland striker Healy. “If teams around us also win, it’s out of our hands. That’s why the top three teams are where they are. Linfield’s latest success meant they picked up maximum points over the month of January. Healy really couldn’t have asked for any more. “The players are starting to believe that good things can happen at this club,” he added. Healy was a little disappointed his boys didn’t ‘push on’ against Carridk after establishing an early two goal lead. “We had a number of great chances in the first half, but didn’t take them,” he added. 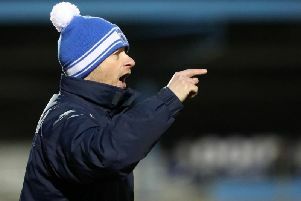 Carrick Rangers boss Gary Haveron insistes his boys failed to turn up in the first 45 minutes. “We were lucky to get away with only two goals,” he said. “Linfield were much the better side. We just didn’t compete. “I think Linfield took their foot off the pedal after the break. They obviously felt the game was done and dusted. We competed a bit more in the second half, which was a positive.